I get it. We are all super busy, we have time constraints at home, work, school and just life in general. Multi-tasking is a skill that many of us have had to learn just from pure necessity! As I am currently writing this post, I have my Consumer Behaviour tutorial playing in the background, my lunch half eaten on my desk, answering the odd back line calls while answering resident questions. And this is my break and I am trying to juggle five different items and none of them are relaxing (except maybe this post because I love writing!). Not much of a break right? This survey was conducted by Subway Canada and while it scares me, I am not shocked by it. More and more we are giving up dedicated ‘us’ time (aka lunch break) to get work done. We try to pack in as much as we can, in as little time as possible. But of course this means more than just losing a lunch time break. It has negative mental and physical health consequences. We are clearly making poorer food choices so that we can eat quicker, we are not eating slowly (I know I now ‘shovel’ food in my mouth so I can keep typing), we are sitting more (which has its own health problems) and not giving our minds the mental break it needs. So how do we fight the working at lunch time battle? Get up and go for a walk. Take fifteen to twenty minutes of your hour lunch break and get outside. You will feel better for this plus you are getting the blood flowing through your legs again. Eat healthy! Make better choices, pack and time your snacks so that you are not munching aimlessly throughout the day. 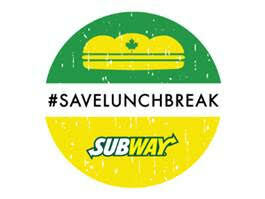 The survey by Subway Canada also found that most workers report they would prefer to reach for a sandwich piled high with meat and veggies (27 per cent) before a greasy burger with a side of fries (21 per cent), last night’s leftovers (21 per cent), a salad with mixed greens (16 per cent) or snacks from the vending machine (3 per cent). So keep this in mind when making take out options! How will you feel after eating a greasy (but quick) meal. Put away work. I mean it, cover it, hide and log out of anything work related for at least ten to fifteen minutes. It will do your mental health wonders. How do you fight the never-ending battle at lunch time to make time for you? This entry was posted in health, health and fitness.